I am new here and I am just trying to save my young sons poor animal. The quick(well its not really quick) part of the story is a little over 3 weeks ago we noticed Brownies ears were dry and it looked like one of them was damaged a little like it had been bitten. We then moved the other pig to a different cage and decided to keep them seperate not knowing for sure what was wrong with Brownie. A day or possibly two goes by and we find brownie with her ears looking even more dry and flaky as well as large scratches. At this point we immediatly contacted a vet to find out what was going on. They said it was most likely ear mites and told us we could try mineral oil to help. Another day and a half of that and now my poor pig is trying to scratch his face off and has some severe self mutilation going on so we take her into a vet that treats exotics and specializes in small animals. They immediatly get her on a treatment of ivermectim and tell us to come back in 14 days for a second treatment. A few days go by and she seems to be doing better not scratching her face off but not really healing much either then around day 8 after the treatment I check on her and she has really done a number on herself scratching her face horribly. At this point I get the poor girl another treatment of ivermectim and get my second one treated at this time as well. I also find your site and start digging through all the great information you have here and wished I had looked weeks ago. I would have never thought that the body wrap like that would have stopped her from scratching herself but it definatly did. There is no doubt to me that Brownie has mange mites and that the treatment of ivermectim needs to continue for at least 4 to 6 treatements my question is can anyone tell me if this looks like she also has a fungal infection as well as the mites? These photos are 2 Megs so they are very large and sad. Oh my - that poor little girl. She looks absolutely miserable! This is so very bad that I'd be tempted to cover all bases and treat for both. You really can't afford to wait to find out if one treatment will work, only to discover later on you're treating for the wrong thing. I've seen sores that look like that, but not quite as extensive. Clearly, because this is on her face you can't do some of the antifungal treatments very easily. If she's had two mite treatments her sores shouldn't be spreading if it's mites. But at this point I'd consider switching to Revolution, which sometimes works better if the mites have become resistant to Ivermectin. Clearly you also need - in my opinion - to rule out fungus. But, has the vet also ruled out a secondary bacterial infection here? Have you tried putting monistat cream on those sores? That cures most fungal infections. And, have you had a test for ringworm? She has been on antibiotics for some time and I have tried nothing to treat for fungus. I am not convinced that the sores are spreading to anywhere she had not mutilated herself and in the last 48 hours since I have been able to control her scratching she does look better. Pretty much everywhere you see scabs she did scratch her hair off or worse. I have not had her tested for ringworm. Don't bother to test right now. Search the forum for a program dose and give her two doses 14 days apart. If she has ringworm you should see a difference. You can get it over the counter. 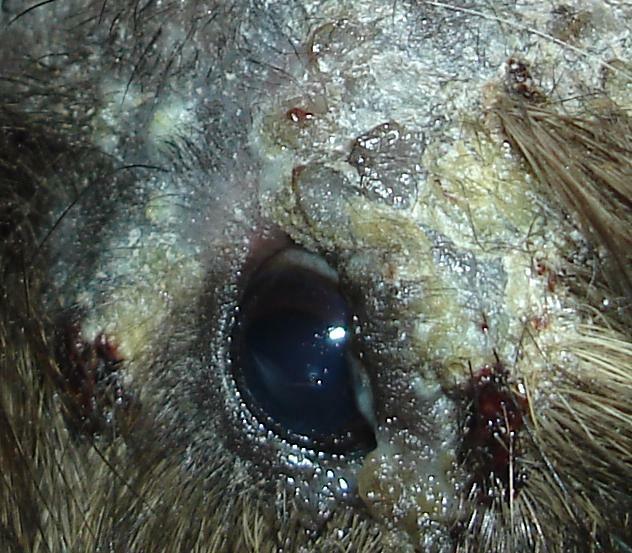 Keep treating with ivermectin or revolution for mites. You should look into getting a cortisone shot as well. 14 days may be too long to wait between ivermectin treatments. 7-10 days is usually better. Treating for both mites and fungus would probably be good. 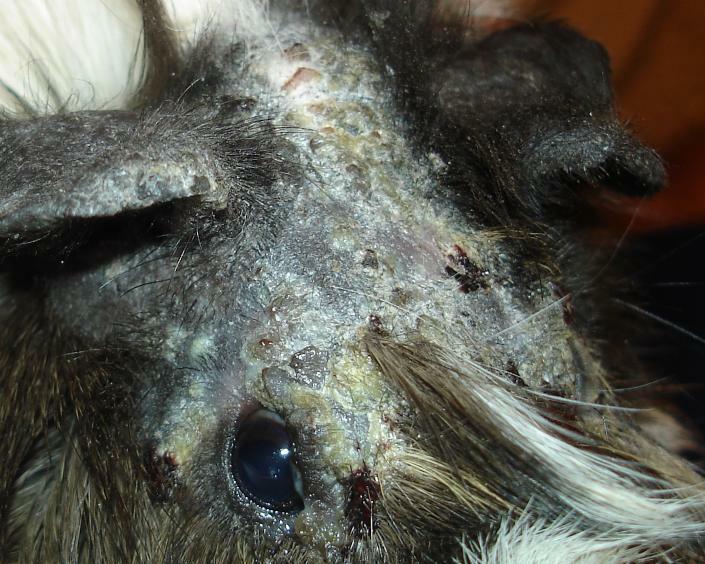 When we had a pig with extremely severe mites, my vet had me use Ivermectin and Revolution (Selamectin) in combination. It worked wonders. You do have to give them a certain number of days apart, but we saw a massive improvement very quickly. Your poor little pig! As the mites die, they likely cause intense itching. Ask your vet if your pig could have some steriods or diazepam to help control this. Let me know if I can add your pics to the site. They are very clear and may help someone in the future. I also would treat weekly. Some people up the dose a bit when it is so severe. Thanks everyone with the advice she sees a vet again today and I will push to get her on a steroid and fungus treatment. The pictures as far as I am concerned are public domain and you can use them any way you like especially if it will help others. Thanks. I took one of the most clear ones and cropped it for two views (one at half size). What antibiotic has she been given? Holy cow. I hope little Brownie feels better soon. Her antibiotic is Sulfatrim Suspension and she seems to be doing a little better. The body wrap is a lifesaver. Hang in there. The bactrim is a good ab. You can dose program yourself. Don't let the vet give you anything else orally for ringworm. Can I ask what vet you are going to in SE Michigan. That is where I am located and I am looking for a possibly better vet. I would treat for mites and also fungus. Mites could be the underlying cause....but your pig definitely has some type of fungus going on....most likely ringworm. Please treat this promptly because both mites and ringworm will kill your pig!! You should get some anti-fungal meds to give orally....and topically. The white powdery part almost certainly is fungal, however, with the open sores and obvious infection (the honey-colored brown sugar-looking stuff generally indicates a staph infection), I'd be careful about treating for the fungus right now. The vet only said ear mites? Did the vet actually look at your pig? I wonder if some sort of antibiotic cream might be in order here. Is Josephine looking at this thread? They only said mites when I took her in last. I have had another vet friend stopping by to give the ivermectim but by his own admission doesnt know anything about Gunea Pigs and has never done anything with them. The vet I did take her to seemed knowledgable and I am going to take her back in. I was just hoping the current treatments would do the trick but while her overall health still seems fine, the scabbing and what is most likely a fungus doesnt seem to be getting less. An oral fungal treatment would be okay though. Yes, there may be a bacterial skin infection too. Ok just got back from the Vets. They did a skin scraping and are doing a fungal test. I really wanted to get some sort of treatment for fungus going but the vet really wanted to get solid results worrying about side effects and complications. The only thing I was really given to do was to continue the antibiotics which I never stopped and use an antibiotic scrub to clean the wounds (Chlorhexadine). The fungal test should be back in a couple days and I have an appointment in two weeks. The Vet is Southgate Animal Hospital and while I don’t really have enough experience with them to recommend them but they were friendly and seemed to answer my questions fully. I will post an updated picture later today. In the meantime, you're still giving weekly ivermectin treatments for mites, right? (Skin scrapings are inaccurate for mites).